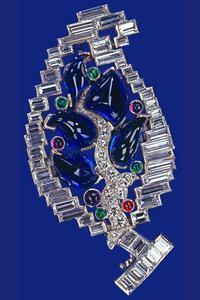 This Art Deco brooch with a staggered frame of diamond baguettes and a vein of pavé-set diamonds features cabochon sapphires in a range of shapes in the middle and is dotted with small amethysts, emeralds, and a ruby. It was made by Cartier in London as a gift from The Duke of York (later King George VI) to The Duchess of York (later Queen Elizabeth The Queen Mother) in 1928. 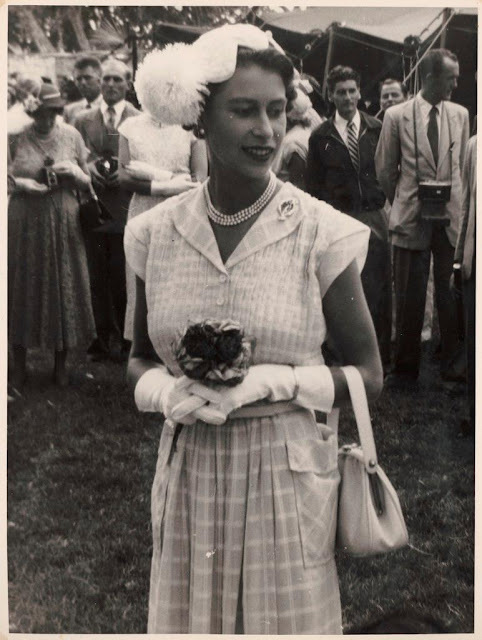 This was one of The Queen's wartime birthday gifts from her parents, one of a few jewels she received in this fashion. Re-gifting things, so to speak, was not at all unusual in a family where jewels regularly pass down the generations, and was a smart choice during the austerity of the war. The Queen Mother used the Leaf Brooch as a jaunty hat ornament in addition to a lapel brooch in her day, while The Queen tends to use it in regular brooch fashion. When she does wear it, that is - this is another piece of jewelry that would be rare to spot today. An appearance in 1997 may have been its last public outing. If it's a Cartier leaf brooch she's wearing today, odds are it will be the Queen Mother's Palm Leaf Brooch instead.